Give resin a chance to spruce up your artwork with this exclusive downloadable bundle! If you're looking for an excuse to experiment with resin, look no further than this exclusive downloadable bundle. Together, CPS November/December 2011, See Found Objects in a New Light, and Breaking Out of the Mold will introduce you to the vast applicability of resin. 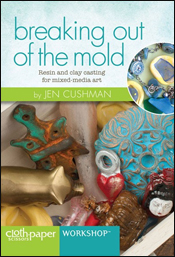 Editorial Director Jenn Mason has benefitted personally from this selection of resources, and wants you to, as well: "If you're looking for some fun new aspects to add to your arsenal of mixed-media skills, you can't go wrong with these three resin happy products!" This issue is just plain fun but the article on using paint and resin in layers changed my life. I love the look of a multiple layers of resin with acrylic paint in between. Everyone is immediately drawn to my resin pieces at shows. 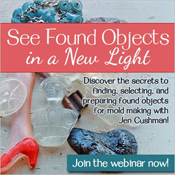 This web seminar is jam packed with great information on found objects and partners perfectly with Jen Cushman's Breaking Out of the Mold Video Workshop. This video helped to break me out of my fear of mold making and casting. Since watching this workshop video, I have gone mold-making crazy! Get all these great mixed-media resources instantly with this limited time digital bundle. Save 40% when you download today!